Want to revamp an old lamp or maybe even build a new one? It's never been easier to tackle a lamp makeover with the amount of inspiration on the internet. We've searched high and low for easy lamp making ideas and DIY lamp projects to get the creative juices flowing. These homemade lamp ideas cover all sorts of styles and budgets, some of which only require a can of spray paint to complete. The only thing limiting you at this point is your willingness to try something new. Just make sure no matter which project you choose, that you learn a bit about electrical work before you get started. There are so many DIY lamp ideas that it can be hard to know where to begin. The first thing to do is decide where you want the lamp to go in your home. Then you will be able to determine things like style, scale, and function. This recycled bottle lamp is large enough, that it works great as the only lamp on an entry table or console table. There are basic light kits on the market that can help you turn pretty much anything into a lamp. To make a galvanized lantern more functional in your home, electrify it, so it can let off much more light than a flameless candle. One thing to note on this project, though, is to be sure you pick the right kind of light bulb that can be in an enclosed space. Some bulbs, even LED ones, emit too much heat and can be a fire hazard. Any beginner woodworker has likely explored the idea of making a DIY lamp base. With designs like this one, it is actually very easy for non-woodworkers to make a DIY wood lamp. The wonderful thing about this project is that there are very clear and concise plans to follow included in the tutorial. When it comes to making DIY lamps, the biggest limitation is your own creativity. If eclectic vintage style is up your alley, think of all the retro items that could be converted into a lamp. This vintage fan is a great example of how old items can be repurposed for entirely different uses. There are tons of lamp painting ideas out there, and you aren't limited to just one idea. You can paint a DIY floor lamp today and decide a few months down the road that you want to paint it again. As long as you enjoy the main base of the lamp, the colors can change to suit your evolving home. DIY lamps are often inspired by lamps that design houses release because oftentimes these designer lamps are way out of our budget. In this case, it can be much more cost effective and creative to come up with a knock-off version. You don't need wood and a saw to make a DIY floor lamp. In this case, an old music stand was repurposed to a floor lamp base. Make sure you keep the lampshade simple and streamlined on this project to make the most of the modern design. If you want to add more farmhouse style to your home, try to make a DIY table lamp out of a large mason jar. To hide the wiring, spray paint the lamp with a mercury glass finish. You could also pick another color that would blend in with your existing decor. There are many ways that bloggers will teach you how to paint a lamp. 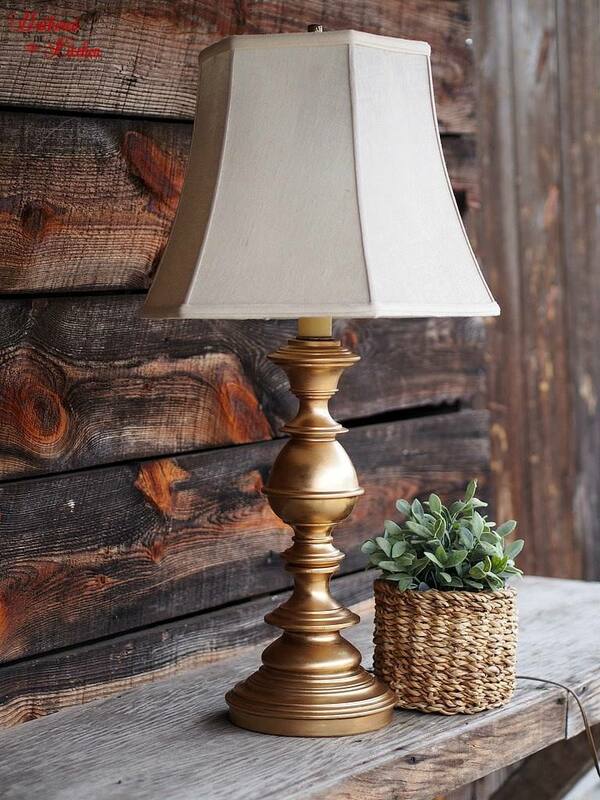 One of the more time-consuming ways is to give your lamp base a distressed finish. Once you master this technique, you'll be able to turn any lamp in your home into one that is much more rustic and vintage looking. Old table lamps are often dated and unsightly, especially those we find at thrift stores. Give these lamps a simple and inexpensive makeover with a coat of matte black paint. The darker color will work to minimize any weird shapes or designs, which will help make it work in a much more modern space. Brassy gold finishes are trending right now, but they are a different sheen than the brass we see on outdated, old lamps that people often throw out. Update the brass with a rub-on finish that is much more on trend and fresh. One creative DIY lamp base idea is to turn the vessel into a terrarium. Just be sure to pick the right type of plants that are able to thrive inside a closed environment. This crafter opted to use sand, airplants, moss, and a variety of crystals. Do you want to build a lamp from scratch but are intimidated by the process? This is one of the most straightforward wood lamp base tutorials out there. Even if you don't own a saw, you can still make this lamp. The base of this lamp is made with 2x4s, and most hardware or lumber supply stores will cut the pieces for you as long as you have the measurements. The best floor lamp makeover doesn't take itself too seriously, which is certainly the case with this upcycled piece. This lamp transformation utilized some old jeans and paper maps to give this piece an eclectic boho feel. Consider wrapping an old floor lamp with scrap fabric to replicate this look. Most industrial lamps are simple and incorporate edison style bulbs. This DIY industrial lamp is made using plumbing fixtures that you can find at a local hardware store, and the base is poured concrete. Make sure whatever you opt to put the lamp on is sturdy because this lamp is a heavy one! This lamp makeover is a bit spooky in part due to the exposed shade. The base is wrapped with a thick manila rope and is versatile enough to go with a wide variety of styles. You don't even need to mess with strong adhesives on this project. This DIYer adhered the rope using a hot glue gun. Most lamp bases are opaque to hide the wire running through the middle. However, you could also keep the base clear and opt to use a bright yellow wire instead. The finished lamp would look charming in a little boys room or an office. If you want a nautical and refined look for a den or office, consider painting stripes onto a lamp base. We suggest keeping the stripes neutral and sticking to deep navy or black with gold accents for the most streamlined effect. When you paint a metal lamp, the main thing you need to consider is the type of paint you use. Make sure you pick a spray paint that is specifically geared toward metal surfaces that get hot. Some paint might not hold up well given the amount of heat metal lamps conduct. If you have a squared off lamp in your child's room that is in need of a makeover, consider facing the exterior with legos. Once you have the main base glued on, you can build all sorts of lego creations on its surface.